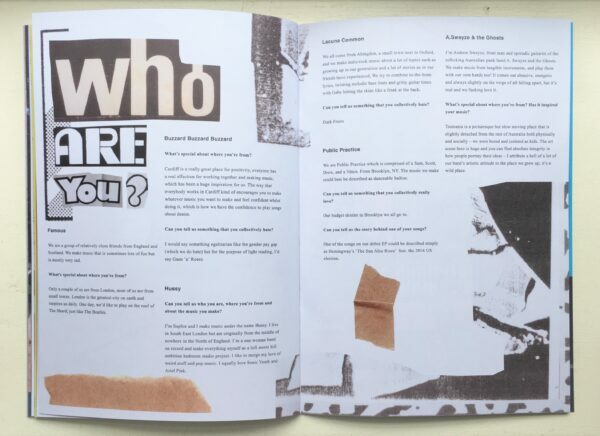 In Issue Twenty we sent over the basics to Cardiff’s Buzzard Buzzard Buzzard ahead of their headline show for We Are So Young 2 on 26/03/19. Check it out below. My name is Tom Rees, and I’m one part of Buzzard Buzzard Buzzard, we’re a rock band from Cardiff, South Wales. Cardiff is a really great place for positivity, everyone has a real affection for working together and making music, which has been a huge inspiration for us. The way that everybody works in Cardiff kind of encourages you to make whatever music you want to make and feel confident whilst doing it, which is how we have the confidence to play songs about denim. Ed on the bass is my brother, so I found him (too) long ago, myself and Ethan on the drums have played in a couple of bands together, whilst Zac on guitar was a childhood friend of Ethan’s. The thing about playing (and living) in Cardiff is that it’s so small you kind of know everyone anyway, so we all had met each other a long time ago but only took the opportunity to play together a couple of years back. Me and Ethan used to record a lot in his parents house, and I was just mucking around one day after listening to ‘Spirit in the Sky’ by Norman Greenbaum, an experience that still haunts my memory to this day – I had listened to that tune innumerable times before but for some reason this time when I listened to it, it had a really deep impact on what I wanted to do musically (I had been in an indie-hole for a while) – essentially I tried ripping off that Norman Greenbaum tune and it really worked. Following this I started digging deep into old 70’s records I loved as a kid but had neglected in my late teens, like Todd Rundgren’sSomething / Anything and Dennis Wilson’s Pacific Ocean Blue, before I had been substituting them for Green Day and My Chemical Romance (forgive me Father for I have sinned). With a fresh love for the 70’s I started working on more bits, and that’s how I arrived at Double Denim Hop, our latest single. There’s an Indian Cafe near our studio called Pooja, which sells a delicious variety of Indian snacks (sweet and savoury), as well as a variety of homemade curries – very very cool – they also have a cafe in Tooting for all the So Young readers out there. I would say something egalitarian like the gender pay gap (which we do hate) but for the purpose of light reading, I’d say Guns ’n’ Roses. There’s a tune we play called Stockholm City Rock, which I wrote on a bus to Stockholm (of all places) with a friend of mine. We were going to Stockholm to see Father John Misty and next to the bus stop there was a sign that said: “NON-STOP TO STOCKHOLM CITY”, which I thought was very rock and roll, so I used it as the first line of the song. The song is subsequently about how tired and cold I was on the bus. What can we be excited for over the next 12 months? We’re really excited to be releasing new music and playing more shows – the new single will be coming soon, and we’ve got a few festivals tricks up our sleeve. 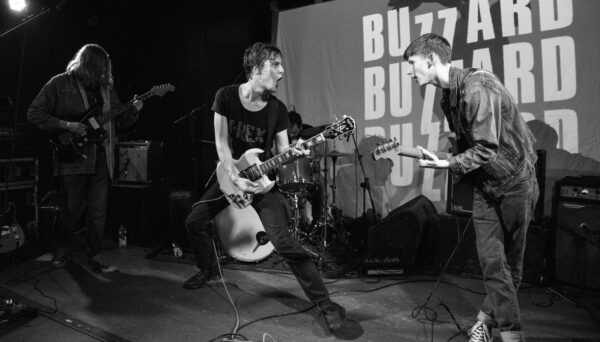 Buzzard Buzzard Buzzard headline We Are So Young 2 on Tuesday 26th March. Tickets here.